GARDAÍ HAVE SAID today that they have now successfully identified the body of a man that was found in December 2006 in the woods by Lough Inagh in Connemara, Co Galway. The man has been named as Arno Schmitz, a German national who had come to Ireland at the end of September 2005. His body was discovered on 8 December 2006 and a post mortem found no evidence of trauma or injury. All that was known about the man at the time was that he was between the age of 44 and 66 when he died, he was 5 foot 7.5 inches tall and of stocky build. He wore a ‘Bush Sports’ yellow hooded jacket and a small holdall bag was found with his remains. Inside it was a Tropicana Pink Grapefruit flavour fruit juice carton with a best before date of 24/12/2005 and a glasses case with a pair of Rayban sunglasses. There was an address on the inside of the case at Neumünster in Germany but enquiries did not reveal any information, as the glasses were non prescription. House to house enquiries and the canvassing of local hotels and guest houses in and around Clifden and the Lough Inagh area also proved fruitless. 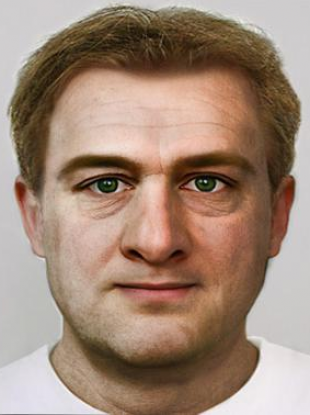 As no identification was forthcoming, the Coroner for West Galway Dr Ciaran McLoughlin made contact with Dr Caroline Wilkinson, a Senior Lecturer in Forensic Anthropology at the University of Dundee in Scotland and the decision was made to release a facial reconstruction image to the Irish media, which was done in 2009. Then in mid December 2013, a further review was undertaken by gardaí with emphasis on the items in the bag found with the man’s remains. Because of the date on the juice carton, they were led to believe he died sometime in late 2005. Lines of communication were continued with Interpol and liaison was made with the German Embassy due to the address on the glasses case but authorities there confirmed that no missing person with a similar DNA profile existed on their Missing Persons Database. In April this year, gardaí asked that a press release be circulated to media in German, particularly in the area of Neumünster and a number of articles, accompanied by the facial reconstruction were published. Finally, there was a breakthrough in the case and one person who came forward was a man who said the image looked very much like that of his brother Arno Schmitz. He said his brother had left Germany for Ireland at the end of September 2005 and had lived in Neumünster before that. Bernd’s Schmitz last contact with his brother Arno was before Christmas 2005 by phone and at that time he was working in Ireland. That was the last he had heard from his brother. However he had not reported him as a missing person. On 7 September, dental charts for the man’s brother were provided to Paul V Keogh, a Forensic Dentist in Kerry and he later informed gardaí that they identically matched the charting he had done from the remains found in 2006. Results of DNA profiles on 12 September also strongly supported the probability that the body was that of Arno Schmitz and this week, German police informed Bernd Schmitz that his brothers’ remains have been found. Email “Gardaí identify body of German man eight years after discovery in Galway woods”. Feedback on “Gardaí identify body of German man eight years after discovery in Galway woods”.